The HPL is currently having a rough old time of it. As ever, I’m finding the writing process cathartic – the writing of happy posts makes me happier and the writing of my recovery process is helping me recover. A few days ago, I went to the YMCA at lunchtime, did a 20 minute swim and a 5 minute sauna and was back at my desk within the hour. I left my office feeling stressed and angry (told you I’m unsettled) and came back feeling much happier and brighter and, lets face it, a little smug. I also revert to a child when I’m in a pool and love the feeling of being able to see under water. So, I’ve decided to swim once a week from now on. I love yoga, I miss yoga. Yoga is good for my body (honestly you should see the arms on the women in the class I used to go to!) and my soul. Its meditative and mindful and calming. But I just don’t seem to be finding time for it every week, so I’m going to go to yoga twice a month from now on. I love dancing but again am crap at going along. Tallulah keeps inviting me to the Frame 80s aerobics classes which sound great (they even had a “Glee” class) and I’d like to try the YMCA streetdance classes. So I’m going to do one dance class a month from now on. I’m also going to try to cycle more at weekends and possibly into work every day (although am a little scared – although the new cycle highways might make it easier and I just need to keep reading Pippalipa’s guest post on the joys of cycling). LOTS of girlie drinks and dinners in the diary this month, too many in fact. Sometimes I feel really in the mood to talk, and talk, and talk. I could talk all night. But I think that’s OK and I know it won’t last forever. One thing I’ve discovered is the power of the teary telephone call to friends. When I used to get upset, I’d retreat into my own shell – like a cat licking its wounds – and deal with problems alone. But that is exactly the time you should call a friend – cry down the phone, and say how awful you are feeling. A problem shared is a problem halved, its good to talk, and more clichés like that. I can’t believe I’ve only realised this recently. I’m buying a bird-table because I want to coax a robin red breast or similar to my Brixton garden. I want a Pepe the Background Bird. Will report back. I’m also doing some improvements on my little flat with the eventual aim of installing a dressing table, dishwasher (oh how my life would improve tenfold) and built-in wardrobe with extra shoe space. These things don’t need to be expensive and the process of nurturing the place you live in to make it even nicer to live in is as good as the final product. (Note – I think I need to turn the TV off a bit more in the evenings to find the time to do things like this). My volunteering for Age Concern has not kicked off yet as I couldn’t fit the induction round my work. I made the playlist for my friend Lady B’s wedding. Hmmm Ok then, need to work on this a little more. Watch this space. I’m excited about this. I’ve booked my ticket to Argentina and have enrolled on a beginners Spanish class at International House! It was recommended by @loulalondon on twitter and it looks great – as well as classes they hold country-specific exhibitions and gigs. My Mexican slang learned from a couple of months on Zippolite beach will hopefully come in handy and I’ll let you know how I get on. Other plans for the summer are to see the Summer Exhibition at the Royal Academy, the Skin Exhibition and the Enchanted Palace at Kensington Palace. I also want to see a lecture at the School of Life. I think two things a month is fine. The 1000 Awesome Things and The Little London Observationist blogs are great at reminding me to appreciate the small things and writing this blog allows me to think about life and happiness all the time. I’m planning to write a bit more on the psychology of happiness because I find it fascinating, and also a list of all the great things I like about London. “be curious” because I am an inquisitive person and generally have several theories on the go at once. But the blog is mostly about restaurants at the moment which was not the initial idea. There are two ways in which I’m lagging especially – “give” and “learn“. I applied to volunteer at a Brixton-based charity every second weekend, but the induction sessions take place during the week and I’ve been finding it hard to take time off work. I think the key is small charitable acts so I need to think of things I can fit around work. As for learning, I’m seeing a couple of exhibitions this month which is good, but I’m long overdue some comedy or theatre; and I’d love to take up a class – Spanish or something creative – but again I’ve not been finding time. But today I randomly got a pingback from 100helixdays which has adopted the HPL Rules. I love how the author has thought of simple, practical ways to fulfil each rule and fit it round his lifestyle – especially the ideas of learning guitar and about wine; and nurturing by creating a roof terrace, spending time with his daughter and improving their home. It has really inspired me. My guitar, piano and trombone are gathering dust so I’ll start small – buy some sheet music and learn to play one new piece well by the end of summer; and I’ll take Lady B out for a photography session so we can practice a bit more. And nurture is an easy one as I’d like to invest lots of my time over summer decorating our new house. I also want to be a bit more active by fitting some yoga in, starting this week. So thank you 100helixdays – I shall be reading how you get on with interest, and am happy that my HPL Rules have been invigorated! 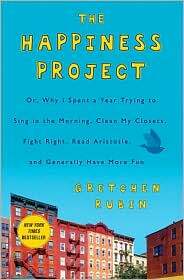 Several people have pointed out to me that, sailing along on the New York Times bestseller list, is a book called The Happiness Project by Gretchen Rubin. These are different to my Rules – they are more specific, psychological. More about the process by which you live your life. A bit Americano perhaps, but I like and want to use some of them – like not calculating (I washed up so you should do the cooking/its your turn to call me), pinpointing specific causes of stress/sadness, and acting the way I want to feel (if I want to cheer up, forcing myself to smile etc). This got me thinking – we are all so different that we need to make up our own rules. Mine work for me because I know what makes me happy. I find myself smiling and content after a long dinner with friends; or if I’ve kept up my yoga practice for a while; or worked in the garden and seen results; or done something for other people. I’m hoping that the other stuff – patience, warmth, relaxation, tolerance, mindfulness, all comes as a result of following my Rules. I’m certainly finding I’m more and more content as I continue the project, although I’m nowhere near as disciplined as Gretchen. Gretchen encourages people to start their own Happiness Projects and so I wanted to spread the word to all you Londoners. It may take you a while (her rules took her 12 months to reflect on) but if you can, start being conscious of what specific things or behaviour patterns make you happy or that you think might make you happier (anything from eating more scotch eggs to calling your best mate once a week to making to-do lists) . Also when you feel unhappy, try to work out what the cause was, and write down ways to combat that feeling again. I’ll be asking friends and other happy people about what makes them happy and will post their answers here, but in the meantime, I’d love to hear what rules you’ve come up with!